Much capacity building about adaptation planning is centred in major cities or at large Universities or International NGOs. The approach in this SIDA funded project is to develop effective learning tools and structured training modules, that can be used either independently or in a training setting. The aim is that it is based on a training needs assessment that will be conducted with the local partners in order to design customised learning approaches and activities. A customised two-day training programme was designed, following a training needs assessment of participants, to provide an introduction to key concepts and methods to inform an adaptation planning process. The training has been developed and delivered to be part of a project to build adaptive capacity in the Province of Negros Oriental, in the Philippines. The training began with an introduction to stakeholder engagement, including exercises designed to highlight the different viewpoints of stakeholder groups and the level of influence of different groups. 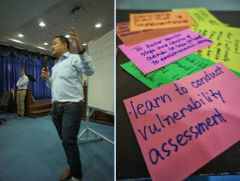 This was followed by a session on vulnerability assessment, using the livelihood-exposure matrix as a way of identifying key climate vulnerabilities. The second day started with an introduction to climate analysis and uncertainty, highlighting different sources of data, and extending the livelihood exposure matrix from Day 1 to assess future vulnerability. In the second part of the day the weADAPT knowledge base was introduced as a resource for the community, and a webinar session was held to test whether this method could be used for follow-up training sessions. The face-to-face training will in future be supported through the development of new modules and post workshop webinars, this is something that has been requested in previous training settings as a way to ensure the sustainability of the network of participants and the support or guidance provided on the applicability of tools. Lessons have been learnt through this process about the training material, how it fits with the expertise of the group and about the logistics of training in the Philippines and the focus on adaptation planning of the participants particularly in the immediate aftermath of typhoon Yolanda/ Haiyan. Gaspillage de l'eau, baisse de la pluie, mauvaise gestion de la production, rechercher mode de gestion participatif eau et bassin-versant /meilleure résilience des exploitants/communauté.